Packet ships were vessels that sailed on a schedule. 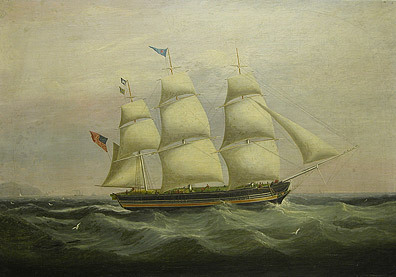 The service begain in 1817 with three ships sailing from New York to Liverpool. Liverpool and New York were the principal ports but Boston and Philadelphia were other major ports, and packet lines were established to most of the major European ports. Joseph Heard was one of many Liverpool artists who painted vessels sailing in and out of Liverpool. His signature is found on the floating piece of wood. Heard and the other Liverpool artists used backgrounds that showed landmarks on the approaches to Liverpool like the South Stack Lighthouse, Anglesey, Wales.